I am resident of India and just got UK Business visa ( 6 months, multiple entry) .. I am going for a week on business trip. I want to take my wife along with me and at the end of trip.. I want to extend my trip for 3 days and we want to spend some time on leisure. What visa I should apply for my wife.. visitor visa? should she mention in the visa form that she is going along with me and staying with me while I am on work and later we are spending time on leisure. While filling my business visa form, there was a field asking if anyone else is going with me.. I selected no.. as there were no plans. You would like your wife to accompany you and need to know which class of visa she should apply for. Your wife should apply as a GENERAL VISITOR. She can use the new site at Visa4UK She can use the VFS and also use the premium service if she qualifies. She can add your information in the remarks section to explain the rationale for her visit. For completeness' sake, The only concession made for family members of business visitors is in the case of 'Academic Visitors'. The concession, stated in Paragraph 42 of the rules, is that the family member can ask for the same amount of leave as the primary, up to 12 months. And even in this case, the family member must apply as a GENERAL VISITOR. For your last question, your original application indicated you would be travelling alone, but now you want to travel with someone. It's a normal change of circumstances and you can put an explanation in with your wife's application. For your question in the comments, you are allowed to act as a tourist during your visit and to stay for a reasonable amount of time within the leave you have been granted. These things should be incidental to your trip and as long as they are incidental, you will have no problems. To play it strictly by the book, you can declare your touring itinerary to the IO during your landing interview. You didn't say when your wife will make her application, and you have also indicated that personal experience is welcome. 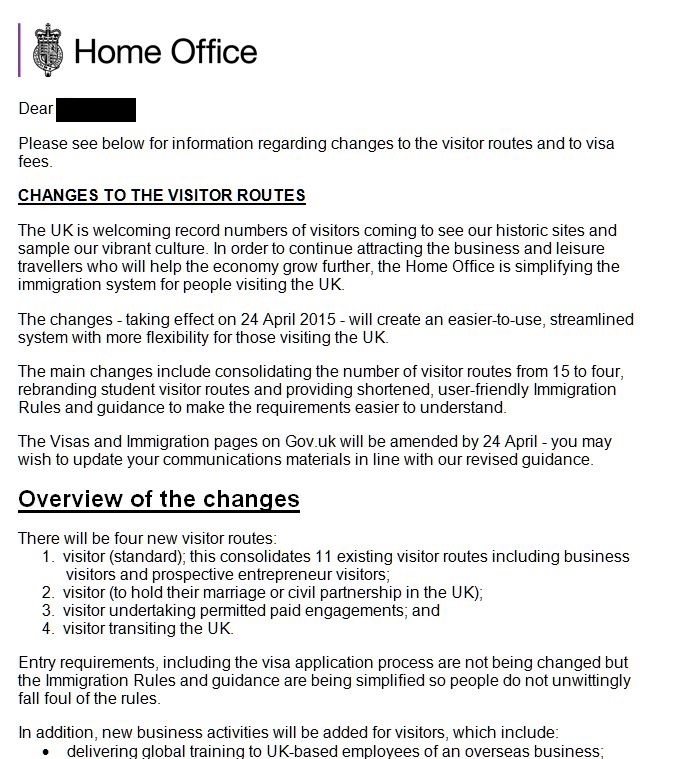 From that viewpoint, the Home Office has just concluded an 'invitation only' consultation and is planning to change the visitor rules sometime before Parliament sits in 2015. This will be the first major overhaul of the visitor rules since 2008. There are links to the consultation and to the draft rules, but they are currently embargoed and behind a paywall. I will post a link here once the embargo is lifted. Personally, there are no planned changes, however, that will enable your wife to accompany you as anything other than as a GENERAL VISITOR. Not the answer you're looking for? Browse other questions tagged visas uk indian-citizens business-travel spouses or ask your own question.